NK cells are responsible for recognizing and killing transformed, stressed, and infected cells. They recognize a set of non–Ag-specific features termed “altered self” through combinatorial signals from activating and inhibitory receptors. These NKRs are also expressed on CD4+ and CD8+ T cells, B cells, and monocytes, although a comprehensive inventory of NKR expression patterns across leukocyte lineages has never been performed. Using mass cytometry, we found that NKR expression patterns distinguish cell lineages in human peripheral blood. In individuals with high levels of CD57, indicative of a mature immune repertoire, NKRs are more likely to be expressed on non-NK cells, especially CD8+ T cells. Mature NK and CD8+ T cell populations show increased diversity of NKR surface expression patterns, but with distinct determinants: mature NK cells acquire primarily inhibitory receptors, whereas CD8+ T cells attain a specific subset of both activating and inhibitory receptors, potentially imbuing them with a distinct functional role. Concurrently, monocytes show decreased expression of the generalized inhibitory receptor leukocyte Ig–like receptor subfamily b member 1, consistent with an increased activation threshold. Therefore, NKR expression is coordinately regulated as the immune system matures, resulting in the transfer of “altered self” recognition potential among leukocyte lineages. This likely reduces Ag specificity in the mature human immune system, and implies that vaccines and therapeutics that engage both its innate and adaptive branches may be more effective in the settings of aging and chronic infection. Natural killer cells quickly recognize and kill cells that display features of “altered self,” including cells that are virus infected, malignant, or stressed. NK cells are stimulated through a paradigm markedly different from that of other lymphocytes. A balance of combinatorial signaling inputs mediated through a collection of activating and inhibitory receptors, collectively termed NKRs, determines NK cell activation status. These receptors include the killer Ig–like receptors (KIRs) that recognize HLA-A, -B, -C, and other ligands, leukocyte Ig–like receptor subfamily b member 1 (LILRB1) that binds a conserved region in all HLA class I proteins, natural cytotoxicity receptors that recognize a variety of pathogen, tumor, and self-derived ligands, C-type-lectin–like receptors that recognize HLA-E, and signaling lymphocyte activation molecule family receptors that recognize a variety of ligands and are critical for immune regulation. Diverse surface marker expression is not unique to NK cells. After activation, proliferation, differentiation, and subsequent maturation, many leukocytes develop into distinct subsets whose diversity correlates with vast functional heterogeneity (1). In addition to markers specific to each lineage, NKRs are also expressed on other cell types found in human peripheral blood, including T cells, B cells, and monocytes (2–5). This phenotypic correspondence mediates functional resemblance (6–8). Like NKRs, some markers of maturation can also be compared across populations because of their broad expression patterns. A relevant example is CD57, a terminally sulfated carbohydrate epitope that irreversibly marks maturity in both NK cells (9) and CD8+ T cells (10). Functionally, CD57+ NK and CD8+ T cells are less proliferative, less responsive to cytokine stimulation, and have a higher cytolytic capacity than CD57− cells (11, 12). In young and middle-aged individuals, CD57+ CD8+ T cells may also be more polyfunctional than CD57− cells (13). CD57 also has medical relevance, as its acquisition has been documented both in the context of aging (14, 15) and in chronic infection (reviewed in Ref. 16). CD8+ T cells that acquire CD57 also lose expression of CD28 and acquire expression of inhibitory NKRs, especially KIR and CD94/NKG2A (10, 17, 18). Mature NKR-expressing CD8+ T cell populations are oligoclonal or monoclonal (10, 19), and mRNA expression of NKRs has been shown to be highly heterogeneous even in cells with identical TCR clonotypes (20). Functionally, NKRs acquired on CD8+ T cells have so far been shown to function primarily through inhibitory signaling, but activating receptor expression patterns have never been evaluated. Because of this ability of NKRs to modify downstream activation status, their expression across cell types has significant implications for the regulation of immunity. The determinants that control human NKR protein expression across immune cell types have not been examined. To fully understand the functional significance of NKR acquisition on CD8+ T and other cells, it is necessary to concurrently evaluate the combinatorial protein expression of all types of NKRs at single-cell resolution. No prior studies have simultaneously evaluated both activating and inhibitory NKR expression patterns across leukocyte lineages. Human studies are also essential to recognize the potential implications of these receptor expression patterns in vaccine and therapeutic strategies, especially given the vast phenotypic differences between murine and human NKR systems. The recently developed high-dimensional analysis platform known as mass cytometry allows for single-cell evaluation of 40+ parameters. Since its inception, this technology has vastly expanded our understanding of the human immune system (21–23). It has also deepened our comprehension of the astonishing diversity of the human NK cell repertoire (24). In addition to analyzing NKRs on NK cells, mass cytometry also permits their examination across multiple cell types in the controlled environment of a single stained sample. In this study, we used this technology to analyze the expression of activating and inhibitory NKRs on NK cells, T cells, B cells, and monocytes in peripheral blood from 22 healthy donors. We sought to determine how the expression of NKR on NK cells and other cell types might reflect the importance of “altered self” detection in diverse branches of the maturing human immune system. This study was performed on cryopreserved human PBMCs in accordance with the Declaration of Helsinki and was approved by the Institutional Review Boards of Stanford University and SRI International. For details of sample sourcing, see Horowitz et al. (24). In brief, subjects included 10 healthy unrelated adults (5 male and 5 female adults, aged 24–60 y, median age 34 y), 2 anonymous blood bank control subjects, and 5 sets of monozygotic twins (4 male and 6 female twins, aged 20–40 y, median age 23 y). Nine of 21 (42.9%) subjects tested were CMV seropositive. All subjects gave fully informed and written consent. PBMCs were thawed and washed with RPMI 1640 (Corning Cellgro) with 10% heat-inactivated FBS, 2 mM l-glutamine, and antibiotics (100 U/ml penicillin, 100 mg/ml streptomycin; Life Technologies BRL/Life Technologies) and rested at 37°C with 5% CO2 for 4 h. Two million PBMCs were stained for mass cytometry analyses as described previously (21, 22, 24). Data were acquired on a CyTOF instrument (DVS Sciences). Data files of mass cytometry analysis of PBMCs in .fcs format for each individual are available for download in ImmPort (https://immport.niaid.nih.gov/) under access number SDY232. where S is the total number of species and pi is the proportional abundance of the ith species. All statistical analyses were performed using the open source statistical package R (http://www.r-project.org). We previously used a mass cytometry platform of 37 lineage markers and NKRs to interrogate the human NK cell repertoire (24). In this study, we used this approach to examine the expression of these markers on 5 leukocyte populations in the peripheral blood from a cohort of 12 healthy unrelated individuals and 5 sets of monozygotic twins. Because we have shown that monozygotic twins deviate significantly in their total NK cell repertoire (24), we considered each pair as separate individuals for the purposes of this analysis. We designed a gating scheme to distinguish five major leukocyte types present in human peripheral blood: CD4+ and CD8+ T cells, B cells, monocytes, and NK cells (Supplemental Fig. 1). To determine phenotypic marker distribution across populations, we calculated the frequencies of surface markers on each cell type for each of the 22 individuals. This shows that several receptors, such as NKp46 and NKG2A, are expressed almost exclusively in NK cells, whereas others, notably LILRB1, are expressed at a range of levels across all five cell types (Fig. 1A). Restricted cell-type expression patterns of NKRs and lineage markers. (A) Frequencies of NKRs on each cell type (designated by unique colors and symbols), as determined by Boolean gating, for each of 22 donors. (B) Fidelity of each receptor for NK cells, as measured by log(frequency on NK cells/frequency on all live cells). KIR2DS4+ and KIR2DS4− individuals (as determined by genotyping) are annotated in green and blue boxes, respectively. Receptors with a log fidelity score >0 were called as NK-specific receptors (red shaded box). We next sought to delineate which receptors were expressed more highly on NK cells than on the other cells. We gave each receptor a score of its “fidelity” for NK cells by dividing its frequency of expression on NK cells by its frequency of expression on all cells. Taking into account data for each receptor for each donor, we ranked receptors from least to most median NK fidelity (Fig. 1B). Although CD56 is the most commonly used NK cell marker, we found that NKp46 (Fig. 1B, far right) is the most NK cell–specific receptor, confirming and extending previous results (25). This analysis also identified a set of 17 receptors that are more frequently expressed on NK cells than on the total cell population and can be used to define NK cells (Fig. 1B, red shaded box). This set of receptors includes the KIRs, natural cytotoxicity receptors, and other canonical NKRs such as CD122, CD16, and NKG2D, but does not include LILRB1, because of its high frequency of expression by monocytes and B cells. We identified considerable variability among donors in the fidelity of NKRs for NK cells, as is indicated by the broad interquartile ranges in the boxplot in Fig. 1B. For some receptors, such as KIR2DS4, surface expression is highly genotype driven. For example, donors with a functional, surface-expressible allele of the KIR2DS4 gene show high fidelity of KIR2DS4 for NK cells (Fig. 1B, green box), but donors without a functional KIR2DS4 gene do not show KIR2DS4 fidelity for NK cells, because they do not express the protein (Fig. 1B, blue box) (24). However, variability in fidelity was observed even among receptors with little genetic polymorphism, such as NKG2A, NKG2C, and NKp46, suggesting that genotype alone is not sufficient to account for the differences. To understand how the NKRs cluster among different cellular subsets, we created a correlation matrix of 21 lineage markers and NKRs based on concatenated data from all detected live cells from all 22 individuals (Fig. 2A). Hierarchical clustering of these receptor coexpression patterns resulted in several distinct clusters consistent with defined cellular lineages, including CD4+ T cells, B cells, and monocytes. The CD4+ T cell cluster is enriched for expression of CD3, CD4, CD127, CD27, and CCR7. CD19, the only B cell marker included in the panel, is not highly coexpressed with any other markers except HLA-DR. Cells coexpressing CD33, HLA-DR, LILRB1, and 2B4 form a distinct monocyte-like cluster. The LILRB1 and 2B4 receptors are also highly expressed on subpopulations of NK cells. The remaining 11 receptors also form a distinct cluster encompassing many NKRs that are highly expressed on NK cells. This cluster also has two distinct subgroups, formed by canonical NK cell markers (CD94, CD122, NKp30, CD56, CD16, NKp46, and NKG2A) and mature NK cell markers (CD57, NKG2C, and NKG2D). Unexpectedly, CD8 also clusters with the mature NK markers, rather than with the CD4+ T cell cluster, even though it is also highly coexpressed with CD3, CD27, and CD127. This analysis therefore shows that, when assessed by NKR expression, CD8+ T cells are more similar to NK cells than to CD4+ T cells. Cell population distributions distinguish roles of NKRs and lineage markers. (A) Hierarchical clustering of a correlation matrix of receptor expression patterns. The Spearman’s correlation, representing the likelihood that each pair of markers is coexpressed on the same cell, is shown on a scale of −1 (red) to 1 (blue). This matrix is built on data from all 22 individuals. (B) Three-dimensional projection of the first three components of a PCA of receptors from all individuals, annotated by cell type. (C) Summary of the contributions of each marker to each of the first three components of the PCA displayed in (B). The size and color of the circle represent that marker’s contribution to each of the first three components on a scale of −0.4 (red) to 0.4 (blue). To understand better the expression of NKRs by the divergent lineages of leukocyte, we performed a principal component analysis (PCA) to reduce the dataset to a small number of components that can explain much of the variation (Fig. 2B). In these data, variance is spread among many components because of the extreme diversity of NKR expression. Despite this complexity, the analysis identified three informative components that together account for 40.8% of the variance in NKR expression patterns (Fig. 2C). NK cell markers, including CD56, NKp46, CD94, NKG2A, CD16, and CD122, contribute most significantly to component 1, whereas components 2 and 3 are mainly shaped by the contributions from monocyte and T cell markers (Fig. 2B, 2C). Like the hierarchical clustering, the PCA cleanly separated cell populations, but additionally provided insight to the positions of receptors that did not fit into cell-type categories. For example, NKG2D segregates between canonical NK cell markers and CD8, indicative of its expression on both cell types (Fig. 2B). Further, this analysis revealed a T cell–NK cell spectrum consisting of CD4+ T cells, CD8+ T cells, mature NK cells, and canonical NK cells. These data help to explain the unexpected position of CD8 in Fig. 2A by showing that CD8+ T cells and mature NK cells are intermediates on a continuum with CD4+ T cells and canonical NK cells at either end (Fig. 2B). To visualize better the distribution of NKR on each cell type, we plotted the average frequencies of each NKR and lineage marker on each cell type in a series of petal plots (Fig. 3A). In this study, we discovered a unique CD8+ T cell expression signature with resemblance to both NK cells and CD4+ T cells. We also observed that LILRB1 is the primary NKR expressed on monocytes and B cells. NK cell specificity of the marker repertoire is inversely correlated with immune maturity. (A) Petal plots representing the average frequency (among 22 individuals) of each receptor’s expression on each cell type. Receptors are filled according to their class (blue = activating/lineage, red = inhibitory, violet = other lineage). Scale is from 0 (center of plot) to 100% (outer edge of plot) receptor expression frequency on the indicated cell type. (B and C) Plots of frequencies on all live cells of CD57 and CD27, respectively, versus NK cell fidelity score, as calculated by the mean fidelity of the NK-specific receptors from Fig. 1B, for each of 22 individuals, with Spearman’s correlations displayed. (D) The total number of NKRs measured per cell (as determined by Boolean gating) on CD57− and CD57+ CD8+ T and NK cells. Paired measurements of NKRs per cell are shown for each of 22 individuals, with Wilcoxon signed-rank statistics. Based on previous reports on KIR acquisition by memory CD8+ T cells (10, 20, 26), we hypothesized that NKR expression on non-NK cells was related to the state of cellular differentiation. We therefore calculated an NK fidelity score for each donor by averaging the NK cell fidelity (the value plotted in Fig. 1B) of each of the cohort-wide top 17 most NK cell–specific receptors. We used the level of CD57 expression on all leukocytes (although it is primarily expressed on NK and CD8+ T cells) as a measure of the maturity of each donor’s total cellular repertoire, because this molecule is known to accumulate in settings of immune maturity including age and immune activation (27). 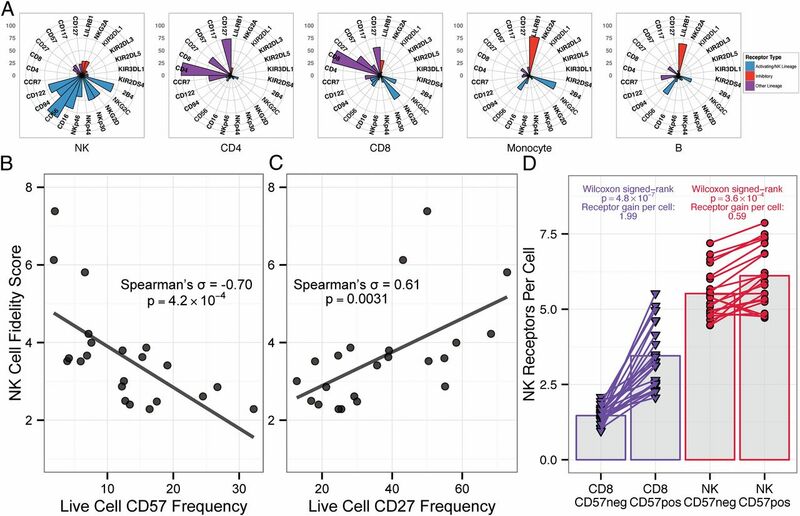 We found that this trend is broadly generalizable: in our cohort of 22 donors, the maturity of the cellular repertoire, as measured by the frequency of CD57 expression on all live cells, is inversely correlated with the NK cell fidelity score (Spearman’s σ = −0.70, p = 4.2 × 10−4; Fig. 3B). The NK cell fidelity score also closely correlates with the frequency of the costimulatory receptor CD27, which is progressively lost during differentiation of T and NK cells (Spearman’s σ = 0.61, p = 0.0031; Fig. 3C). 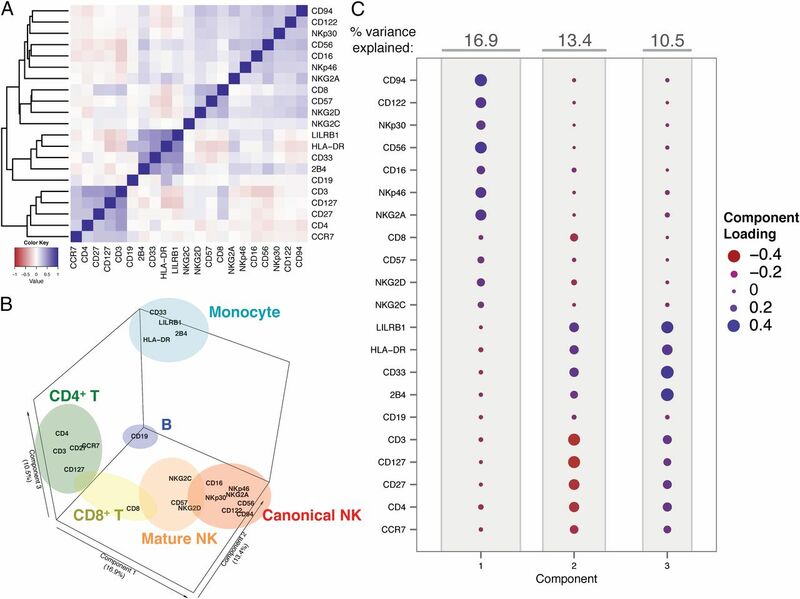 To determine the degree to which the fidelity–maturity link is driven by maturing NK cells expressing fewer NKRs and maturing non-NK cells acquiring NKR, we used Boolean analysis to categorize the expression of each receptor on each cell as positive or negative, allowing quantification of the total number of receptors on a per-cell basis. We used these data to compare the maturity-driven gains in total number of receptors on NK cells and also on CD8+ T cells, which express the most NKRs of all non-NK cell types (Fig. 3A). For both CD8+ T (Wilcoxon signed-rank p = 4.8 × 10−7) and NK cells (Wilcoxon signed-rank p = 3.6 × 10−4), more receptors are expressed on CD57+ cells than on CD57− cells (Fig. 3D). Maturing CD8+ T cells gain an average of 1.99 receptors per cell, compared with only 0.59 receptors for NK cells. Despite its ability to skew the immune repertoire, donor serostatus for CMV is not sufficient to explain the acquisition of NKRs on either cell population: CMV+ and CMV− donors are indistinguishable in the extent to which their mature CD8+ T and NK cells upregulate NKR (Supplemental Fig. 2). Thus, as the immune response becomes more mature, CD8+ T cells broaden their repertoire by acquiring NK cell machinery. This is also true when CD8+ T cell maturity is measured by loss of CCR7 and CD27 (28) (Supplemental Fig. 3). Because maturing CD8+ T cells acquire NKRs and become intermediates on the NK cell–T cell continuum, as shown in Fig. 2, we next examined whether single-cell patterns of phenotypic expression of NKRs could distinguish CD8+ T and NK cells. The Boolean data divide the population of cells into discrete subpopulations, so we used a multivariate dimensionality reduction tool known as correspondence analysis, which is designed for such noncontinuous incidence data. Performing this analysis on each of the five cell types from each donor revealed two primary components that readily separated CD8+ T and NK cells (Fig. 4A). CD8+ T cells therefore express unique combinations of NKRs, forming a distinct, non-NK cell niche. Determinants of diversity in NK cells and CD8+ T cells. (A) Correspondence analysis of all Boolean subpopulations from all cell types (designated by unique colors and symbols) from all 22 individuals. The two mostly highly informative components are shown on the axes. (B) Plots of the frequency of CD57+ cells (as a marker of maturity) versus the diversity of NKRs on each cell type, as measured by the Inverse Simpson Index. Significant associations by Spearman’s correlation are annotated. To understand how NKR expression patterns and the individual cellular combinations of receptors differed among cellular lineages, we used a well-established method borrowed from ecology to quantify diversity. We used Boolean analysis to classify a cellular “species” based on the expression of a unique combination of receptors. We then considered each cell type to be a “population.” This allowed us to quantify the diversity of NKRs on each cell type using the inverse Simpson Index, which accounts for both the distribution and the total number of species in a population (29). We find that NK diversity correlates with repertoire maturity (Spearman’s σ = 0.44, p = 0.043; Fig. 4B). As predicted by their acquisition of a substantial number of NKRs in Fig. 3D, CD8+ T cells also show a strong significant correlation of repertoire maturity with diversity (Spearman’s σ = 0.69, p = 5.3 × 10−4). Monocytes, B cells, and CD4+ T cells show no correlations of maturity with NKR diversity. Therefore, although they have distinct patterns, both CD8+ T and NK cells diversify their NKRs as the cellular repertoire matures. To understand the differential diversification of NK and CD8+ T cells during maturity, we divided both the NK cell and the CD8 T cell populations into two subpopulations, according to their expression of the cellular maturity marker CD57. We then compared the difference in frequency of each receptor between CD57− and CD57+ cells (Fig. 5A). Compared with immature CD57− NK cells, mature CD57+ NK cells (Fig. 5A, filled sections) express higher levels of KIR2DL1, KIR2DL3, NKG2C, and CD16, LILRB1, KIR3DL1, KIR2DS4, 2B4, and NKp30. They also express lower levels of NKG2A, NKG2D, NKp46, and CD122. These gains and losses are not dominated by any single receptor or set of receptors. By contrast, compared with immature CD8+ T cells, mature CD8+ T cells (Fig. 5A, unfilled sections) show increased expression of six primary receptors: LILRB1, 2B4, NKp30, CD56, CD94, and CD122. Mature CD8+ T cells also express slightly higher levels of all remaining NKRs and, unlike NK cells, do not show reduced expression of any NKRs. This analysis therefore revealed maturation programs unique to each cell type. The changes in frequency associated with the gain of CD57 on NK cells were similar to those found on the recently described “memory-like” NKG2C+ NK cells, with notable differences including increased NKp30 and decreased NKG2D on CD57+ NK cells (Supplemental Fig. 4). Differential maturation programs of NK and CD8+ T cells. (A) The difference of each receptor’s frequency on CD57+ versus CD57− cells, averaged across 22 individuals. Filled bars represent NK cells and unfilled bars represent CD8+ T cells, with inhibitory receptors in red and activating receptors/lineage markers in blue for both cell types. Scale represents the change in the frequency of expression on CD57+ versus CD57− cells from −10% (10% less expression on CD57+ cells) to 30% (30% more expression on CD57+ cells). (B and C) Total number of inhibitory receptors (B) or activating receptors/lineage markers (C) on CD57− and CD57+ CD8+ T and NK cells. (D) Summary box plot showing the per-cell count of each receptor type on each cell population. (E) Spearman’s correlation of CD57 frequency on all live cells and LILRB1 frequency on each cell type. To understand how these changes are mediated on a single-cell basis, we calculated the number of inhibitory receptors on each of these four populations of CD57− and CD57+ CD8+ T and NK cells (Fig. 5B). Both cell types are similar in their acquisition of inhibitory receptors with maturation: maturing CD8+ T cells gain a mean of 0.55 inhibitory receptors per cell, whereas NK cells gain 0.31 (summarized in Fig. 5D). Notably, the distribution of inhibitory receptors on mature CD57+ CD8+ T cells and immature CD57− NK cells is markedly similar. Both NK and CD8+ T cells gain activating receptors with maturity, but the difference in magnitude is striking (Fig. 5C, 5D). Maturing CD8+ T cells gain a mean of 1.43 activating receptors per cell, whereas NK cells gain just 0.28. Thus, CD8+ T cells gain both activating and inhibitory potential when they mature, whereas NK cells acquire primarily inhibitory potential. Finally, we examined maturity-driven changes in LILRB1, which was unique among receptors examined in its high level of expression on multiple leukocyte types. This receptor is expressed on monocytes and B cells (Fig. 1A), and is highly upregulated on maturing CD8+ T cells (Fig. 5A). We therefore asked whether LILRB1 expression on monocytes and B cells relates to NK and CD8+ T cell repertoire maturity. With increasing CD57 levels, LILRB1 is significantly increased on CD8+ T cells (Spearman’s σ = 0.69, p = 3.4 × 10−4; Fig. 5E). Remarkably, it is concurrently significantly decreased on monocytes (Spearman’s σ = −0.46, p = 0.032) and B cells (Spearman’s σ = −0.64, p = 0.0012; Fig. 5E). Taken together, our observations of simultaneous acquisition and loss of NKRs across multiple cell types suggest a coordinated regulation of NKR expression in the maturing human immune system. We used mass cytometry to identify the selective expression of activating and inhibitory NKRs in human PBMCs. We found that NK, monocyte, CD4+ T, CD8+ T, and B cell populations form distinct populations based on their surface NKR expression patterns. Our data reveal that, as the immune repertoire matures, NKRs are more likely to be found on non-NK cells, especially CD8+ T cells. Our findings further demonstrate that the diversity of the NKR repertoire on both CD8+ T and NK cells, but not other leukocytes, increases with maturity. However, based on their single-cell NKR combinatorial expression patterns, we show for the first time, to our knowledge, that these two cell types are driven by differential maturation programs. NK maturation is mediated primarily by the acquisition of specific inhibitory receptors, especially KIR, whereas CD8+ T cells acquire both activating and inhibitory receptors, especially those used for generalized recognition. Finally, we show that monocyte and B cell populations downregulate LILRB1 as CD57 accumulates in the total cellular repertoire. These data indicate that the expression of NKR is coordinately regulated on divergent cell types as the human immune system matures. The acquisition of both activating and inhibitory receptors on CD8+ T cells as they mature suggests increasing reminiscence of NK cells. Although their inhibitory receptor acquisition does include specific inhibitory KIRs, it is mediated mainly by upregulation of generalized recognition receptors, especially LILRB1, NKG2A, and 2B4. Increased inhibitory capacity could help to explain recent functional data showing that, contrary to long-held dogma, memory CD8+ T cells actually require a higher Ag concentration for activation than do naive CD8+ T cells (30). It has also been suggested that the presence of inhibitory receptors renders CD8+ T cells less susceptible to activation-induced cell death, allowing them to be selectively maintained (31, 32). Dampening the activation potential of each individual clone could also prevent aberrant reactivity and promote response optimization by non–Ag-specific signals in a differentiated population of CD8+ T cells that is known to be both oligoclonal (19) and cross-reactive (33). Further, the acquisition of noncanonical, NK-like roles of CD8+ T cells is not without precedent, because these cells have recently been shown to contribute to control of infections and tumors in an HLA-E–restricted manner (34). Along with inhibitory receptors, maturing CD8+ T cells also acquire activating receptors, and the increase in NKp30 is especially striking. In addition to its roles in viral recognition, NKp30 has been shown to specifically activate by binding to its ligands B7-H6, which is expressed on tumor cells (35), and BAG3, which is released from tumor cells (36) and immature dendritic cells (37). On a single-cell level, as CD8+ T cells become more refractive to stimulation through the TCR, perhaps it is advantageous for them to acquire such additional non–Ag-specific roles in the immune response by acquiring the machinery of NK cells. Although CD8+ T cells become more NK cell–like as they mature, our data demonstrate that their specific maturity program diverges from that of NK cells. This finding is consistent with literature showing distinct transcriptional regulation of KIR (38) and differing patterns of surface KIR expression (10) in these cell types. It is also logical based on the context of cellular activation triggers. CD8+ T cells require Ag-specific stimulation whose cross-reactivity may need to be checked during immune aging. NK cells do not require Ag-specific stimulation; therefore, creating new combinations of receptors may be sufficient for recognition of a diverse assortment of Ags. In addition, NK cells continue to acquire inhibitory receptors while showing little change in the number of activating receptors, which could help to avoid aberrant reactivity during their maturation. The increased diversity of NKR expression on NK and T cells during maturation may be an adaptive mechanism to maintain a robust immune response. A decrease in T cell AgR diversity during immune maturation has been well-documented (39–42) and may contribute to age-related immunodeficiency (43) and response to vaccination (44). Thus, the increased diversity of NKR on both NK and CD8+ T cells with maturity suggests that NKR expression is a uniquely regulated process that maintains a diverse pool of responders. NK and cytotoxic CD8+ T cells have similar effector functions, which are performed principally by NK cells in the innate immune response and by CD8+ T cells in the adaptive immune response. As the adaptive immune response becomes more mature, the broadening and increasing sophistication of the CD8+ T cell response could potentially compensate for the decreasing diversity in AgRs. CD57 accumulates on NK cells (14) and CD8+ T cells (45) as humans age, and has been documented in a variety of infections. Because our analyses addressed the changes in NKR expression occurring with CD57 acquisition, our findings have implications for understanding the immune system in a state of both aging and chronic infection. Because monocytes and B cells express little to no CD57 (Fig. 1), it has been difficult to discern how changes in their receptor expression correlate with this maturity marker. In this study, we took advantage of CD57 expression on NK and T cells, measured simultaneously through mass cytometry, to understand the expression of NKRs on these cells as the total immune repertoire matures. We find that monocytes and B cells show progressively less LILRB1 expression in more mature repertoires, whereas CD8+ T cells acquire more. LILRB1 expression has been associated with Ag presentation capability in monocyte-derived dendritic cells (46), so it is possible that this function is decreased as the repertoire matures. Lowering the threshold for monocyte and B cell activation by decreasing inhibitory capacity through decreased LILRB1 expression would also be a logical balance to help promote inflammatory responses as CD8+ T cells become more difficult to activate. CD57 expression has been associated with decreased replicative capacity of CD8+ T cells, which could reduce their ability to control infection (47). Yet, these cells are not eliminated. Our data may help to explain this discrepancy. By upregulating both activating and inhibitory receptors, maturing CD8+ T cells may actually be acquiring a distinct functional role in the immune response. This could reflect a systemic shift in priorities. As humans age and thymic output gradually ceases, the importance of maintaining T cell homeostasis is increased. It might therefore be important for those T cells already in circulation to be able to respond quickly both to their cognate Ag and to other Ags for which naive T cells are no longer being produced. These results also illuminate important differences between murine and human immune systems. The upregulation of multiple inhibitory receptors on CD8+ T cells we observe in healthy humans is very similar to that observed during chronic viral infection in mice (48). However, our donors’ serostatus for CMV, an extremely prevalent chronic viral infection known to skew human immune repertoires (49), is not sufficient to explain their acquisition of NKRs on maturing NK or CD8+ T cells (Supplemental Fig. 2). This suggests that maturity-driven NKR expression on these cell types is influenced by multiple factors, which may include other viral infections or environmental stimuli. Thus, the pathogen-rich environment of human existence resembles a state of induced chronic infection in mice. This has important implications for the interpretation of murine immunology studies. Chronic infection models in mice may actually be more relevant to the human condition than the murine steady-state. We therefore propose that a maturing immune system becomes increasingly Ag independent. CD8+ T cells require higher concentrations of Ag to overcome inhibitory signals and achieve stimulation, and may additionally acquire non–Ag-specific roles through upregulation of activating NKRs. Concurrently, maturing NK cells diversify receptor combinations present in their repertoire, enhancing their surveillance potential, whereas monocytes, the precursors to DCs, have a lower activation threshold and may be less able to present Ag. This shift may have evolved when humans lived in isolated communities, where the probability of encountering novel Ags decreased with increasing age, shifting the priority of the mature immune system to maintaining homeostasis. In the modern era, where transportation creates a constant onslaught of novel Ags, this property may help explain the increased immunodeficiency observed in human aging. These dramatic effects of maturity on the human immune NKR repertoire should be considered in the design and administration of vaccines and therapeutics, as Ag-specific responses may require boosting both innate and adaptive immune responses in an aging population. We thank Drs. Natalie Bezman, Mark Davis, and Holden Maecker for helpful discussions and comments on the manuscript. This work was supported by National Science Foundation Graduate Research Fellowship DGE-114740 (to D.M.S.-A. ), National Institutes of Health (NIH) Training Grant T32 AI07290 (to A.H.), NIH Grant AI22039 (to P.P. ), a Beckman Young Investigator award (to C.A.B. ), and NIH Director’s New Innovator Award 1DP2AI112193 (to C.A.B.).
. 2010. Promoter choice and translational repression determine cell type-specific cell surface density of the inhibitory receptor CD85j expressed on different hematopoietic lineages. Blood 115: 3278–3286.
. 2005. Inhibitory receptors CD85j, LAIR-1, and CD152 down-regulate immunoglobulin and cytokine production by human B lymphocytes. Clin. Diagn. Lab. Immunol. 12: 705–712.
. 1998. The MHC class I binding proteins LIR-1 and LIR-2 inhibit Fc receptor-mediated signaling in monocytes. Eur. J. Immunol. 28: 3423–3434. 2006. Natural killer cell developmental pathways: a question of balance. Annu. Rev. Immunol. 24: 257–286.
. 2011. NK cell development, homeostasis and function: parallels with CD8+ T cells. Nat. Rev. Immunol. 11: 645–657.
. 2012. CD8 T cells express randomly selected KIRs with distinct specificities compared with NK cells. Blood 120: 3455–3465.
. 2010. CD57 defines a functionally distinct population of mature NK cells in the human CD56dimCD16+ NK-cell subset. Blood 116: 3865–3874.
. 2014. CMV latent infection improves CD8+ T response to SEB due to expansion of polyfunctional CD57+ cells in young individuals. PLoS ONE 9: e88538.
. 2010. Human NK cells display major phenotypic and functional changes over the life span. Aging Cell 9: 527–535.
. 1986. The expanded null cell compartment in ageing: increase in the number of natural killer cells and changes in T-cell and NK-cell subsets in human blood. Immunology 59: 353–357.
. 2013. Functional significance of CD57 expression on human NK cells and relevance to disease. Front. Immunol. 4: 422.
. 2011. Finding balance: T cell regulatory receptor expression during aging. Aging Dis. 2: 398–413.
. 2008. Human cytomegalovirus infection induces a rapid and sustained change in the expression of NK cell receptors on CD8+ T cells. J. Immunol. 180: 4550–4560.
. 1996. Human CD8+ T lymphocyte subsets that express HLA class I-specific inhibitory receptors represent oligoclonally or monoclonally expanded cell populations. Proc. Natl. Acad. Sci. USA 93: 12433–12438.
. 2001. The repertoire of killer cell Ig-like receptor and CD94:NKG2A receptors in T cells: clones sharing identical alpha beta TCR rearrangement express highly diverse killer cell Ig-like receptor patterns. J. Immunol. 166: 3923–3932.
. 2012. Multiplexed mass cytometry profiling of cellular states perturbed by small-molecule regulators. Nat. Biotechnol. 30: 858–867. Horowitz, A., D. M. Strauss-Albee, M. Leipold, J. Kubo, N. Nemat-Gorgani, O. C. Dogan, C. L. Dekker, S. Mackey, H. Maecker, G. E. Swan, et al. 2013. 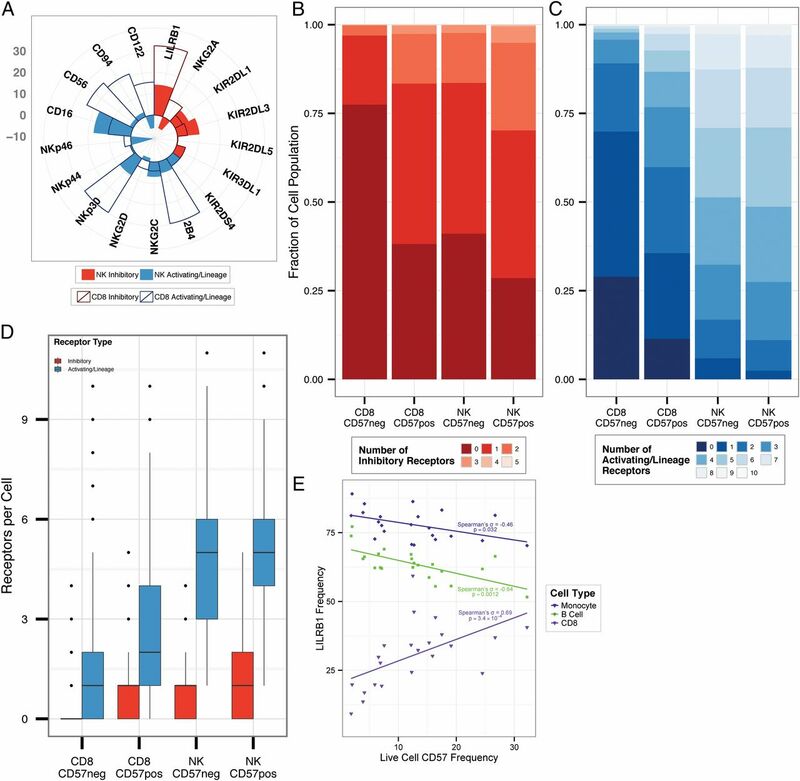 Genetic and environmental determinants of human NK cell diversity revealed by mass cytometry. Sci. Transl. Med. 5: 208ra145.
. 2007. Identification, activation, and selective in vivo ablation of mouse NK cells via NKp46. Proc. Natl. Acad. Sci. USA 104: 3384–3389. 2007. Immune remodeling: lessons from repertoire alterations during chronological aging and in immune-mediated disease. Trends Mol. Med. 13: 94–102.
. 2010. CD57+ T lymphocytes and functional immune deficiency. J. Leukoc. Biol. 87: 107–116. Colwell, R. K. 2009. Biodiversity: Concepts, patterns, and measurement. In The Princeton Guide to Ecology. S. A. Levin, S. R. Carpenter, H. C. J. Godfray, A. P. Kinzig, M. Loreau, J. B. Losos, B. Walker, and D. S. Wilcove, eds. Princeton University Press, Princeton, NJ, p. 257–263.
. 2014. Memory CD8+ T cells exhibit increased antigen threshold requirements for recall proliferation. J. Exp. Med. 211: 345–356.
. 2001. Involvement of inhibitory NKRs in the survival of a subset of memory-phenotype CD8+ T cells. Nat. Immunol. 2: 430–435.
. 2004. Inhibitory NK-cell receptors on T cells: witness of the past, actors of the future. Nat. Rev. Immunol. 4: 190–198.
. 2010. The emerging role of HLA-E-restricted CD8+ T lymphocytes in the adaptive immune response to pathogens and tumors. J. Biomed. Biotechnol. DOI: 10.1155/2010/907092.
. 2008. Dendritic cells release HLA-B-associated transcript-3 positive exosomes to regulate natural killer function. PLoS ONE 3: e3377.
. 2005. Distinct transcriptional control mechanisms of killer immunoglobulin-like receptors in natural killer (NK) and in T cells. J. Biol. Chem. 280: 24277–24285.
. 1993. Clonal predominance of T cell receptors within the CD8+ CD45RO+ subset in normal human subjects. J. Immunol. 151: 5762–5769.
. 2000. Age-related dysregulation in CD8 T cell homeostasis: kinetics of a diversity loss. J. Immunol. 165: 2367–2373.
. 1994. Clonal populations of T cells in normal elderly humans: the T cell equivalent to “benign monoclonal gammapathy”. J. Exp. Med. 179: 609–618.
. 1997. Expanded CD4+ and CD8+ T cell clones in elderly humans. J. Immunol. 158: 4493–4499.
. 1996. Natural killer cell cytotoxicity in elderly humans after influenza immunization. Clin. Diagn. Lab. Immunol. 3: 105–108.
. 2005. Does memory improve with age? CD85j (ILT-2/LIR-1) expression on CD8 T cells correlates with ‘memory inflation’ in human cytomegalovirus infection. Immunol. Cell Biol. 83: 182–188.
. 2010. Leukocyte immunoglobulin-like receptors maintain unique antigen-presenting properties of circulating myeloid dendritic cells in HIV-1-infected elite controllers. J. Virol. 84: 9463–9471.
. 2009. Cytomegalovirus and human immunosenescence. Rev. Med. Virol. 19: 47–56.